Experts agree that pigs are just as smart and emotional as dogs. And that makes it all the sadder that pigs on factory farms endure such hellish treatment. Recently, this photo showing piglets trying to huddle next to their mom through the metal bars of a farrowing crate shocked people. "The farrowing crate helps to keep the piglets safe, preventing the sow from laying on them and crushing them," Calgary Stampede, an organization that promotes farming, wrote in the caption, informing the public that mother pigs and piglets "live in farrowing crates for 21 to 27 days." But many commenters called the image as they saw it: "atrocious," "sad" and "a disgrace." The truth is that factory farms are built to keep pace with the demands for quickly and cheaply produced meat, so pigs spend their whole lives in crates like this. "Pigs are impregnated in a crate. Once confirmed that the pig is pregnant, they're confined in a gestation crate for a few months until they're moved to farrowing crates where they finish the pregnancy," Christopher Berry, staff attorney at the Animal Legal Defense Fund (ALDF), told The Dodo. "Then, they're confined to the farrowing crates for a month while they nurse. 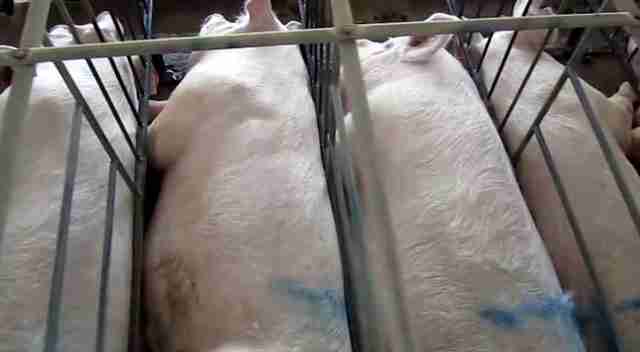 They're shuffled between gestation crates and farrowing crates their whole lives until they're slaughtered." 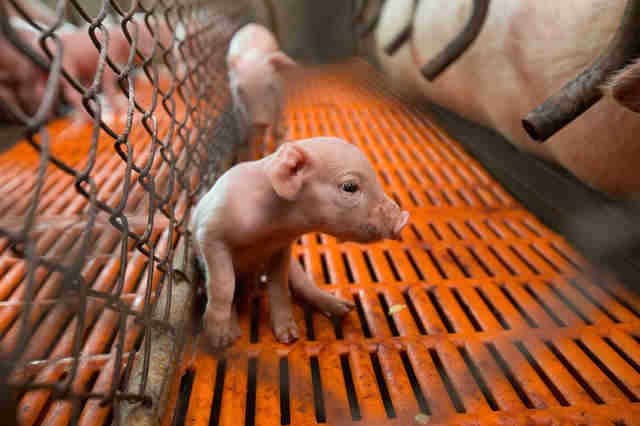 Pigs on factory farms are confined during their pregnancies - in what are known as gestation crates - and after giving birth - in farrowing crates, like the picture above depicts. "Farrowing crates immobilize mothers and prevent them from engaging in meaningful, mutually beneficial interactions with their young," Gene Baur, cofounder and president of Farm Sanctuary, told The Dodo. "The mother can't even turn around to nuzzle and see her babies." The industry claims that farrowing crates protect piglets from being crushed by their mother, but Berry said that argument is misleading. "What the industry wants to do is confine mother pigs and piglets in a very small area without any sort of bedding materials or any other natural elements of a pig's nest," Berry said. "In more normal circumstances, crushing wouldn't be an issue. What's driving this whole argument is efficiency and keeping costs down." People who care for pigs rescued from factory farms agree that farrowing crates rob pigs of natural motherhood. 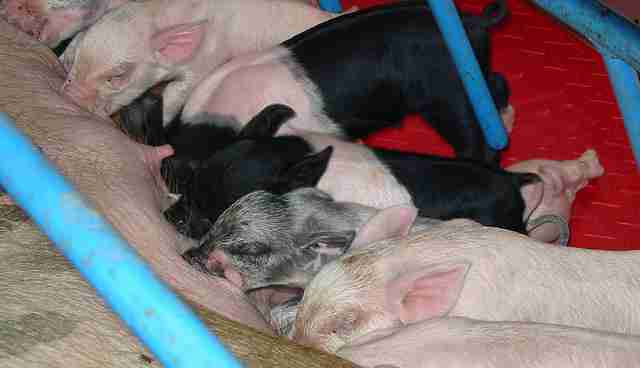 And pig mothers can be very loving and protective of their babies. "In Farm Sanctuary's 30-year history of rescuing mother pigs, we've found them to be nurturing, caring mothers, who do not crush or otherwise harm their babies," Baur said. "Like other factory farming equipment, the farrowing crate reflects an attitude that commodifies sentient life and treats living feeling creatures like inanimate production units."